Two of the graduate programs in the University of the Assumption School of Education were granted initial accreditation (Level I Status) by the Philippine Accrediting Association of Schools, Colleges and Universities (PAASCU). 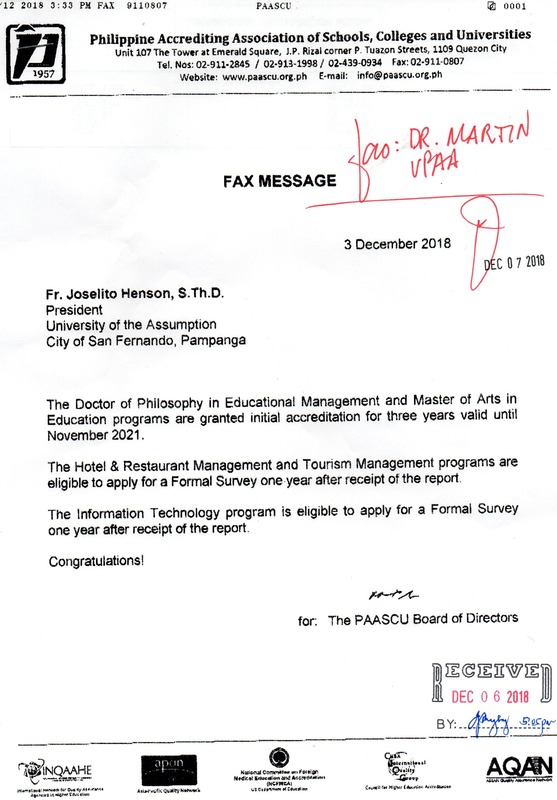 The Doctor of Philosophy in Educational Management and Master of Arts in Education programs passed the rigid evaluation conducted by the accreditation team in December last year. Dr. Ruth B. Ducut, dean of the School of Education announced the new achievement which proves the consistency of the quality of professional education that the University of the Assumption is offering. “We passed the quality standards set by PAASCU for our graduate program. This will add to the number of accredited programs which will pave the way to our autonomy,“ she said. The accreditation is good for three years, until November 2021. Meanwhile, the UA Grade School and UA High School are PAASCU Level-3 reaccredited while a number of undergraduate programs have level 2 re-accreditation. Moreover, three (3) undergraduate programs qualified to apply for formal survey within one year while five (5) undergraduate programs will be visited by a team of accreditors in January for re-accreditation.